Google Maps has a lot of potential when it comes to navigation and GPS, but it also can be extended to making your journey even better. Certain nifty features like adding multiple stops, pit stops, offline navigation and indoor maps were added by the company recently. How many times have you always wanted to share the location of your favourite cafe, or holiday spot to your friends but found it clumsy to send them the exact coordinates? Google Maps has done away with this as the latest update brings the ability to share your favourite locations with your friends. 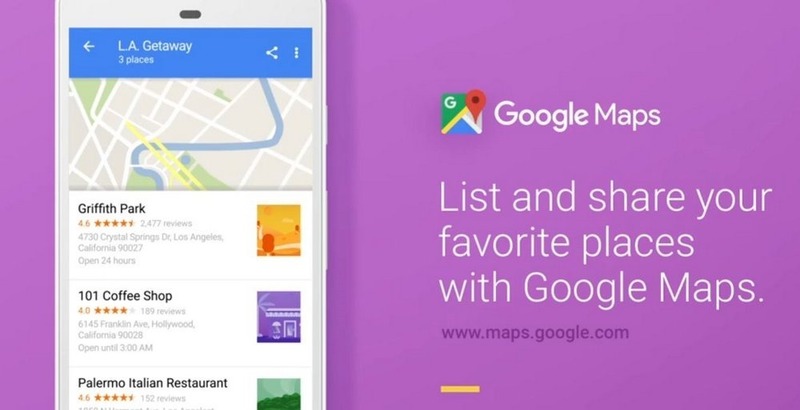 Starting today, you can create lists of places, share your lists with others, and follow the lists your friends and family share with you – without ever leaving the Google Maps app (Android, iOS). You can save specific spots and share directly from the app. Google is rolling out the update to Android and iOS users in phases, so if you haven’t got it yet, make sure to keep checking the app stores for regular updates. If you have got the latest version installed, you’ll be able to do the following. Open the Google Maps app on your smartphone, search for the destination you want to go or have visited and want to save, click on the ‘save’ icon. Tapping on the button with prompt you with pre-set lists like “Want to Go” or “Favorites.” You can also create your own lists like “Must go places to see around this city”. To look back at all such places, left swiping in the app and going to places tab, you will be able to see all the saved locations. You will get icons for these places and an option to share it with other people via text, email, social networks and leading messaging apps. Once the other person has received the list, they can tap ‘Follow’ to get the list of places recommended by you. Let’s say you saved all the must have food joints in Delhi-NCR, you can create one list of such places and share it with people you want to explore them. The lists you follow are with you wherever you take Google Maps and are viewable on mobile and desktop, and even offline. Next time you’re on a trip, download offline maps of the area in advance and you’ll be able to see all the places you’ve added to lists on the map itself. It is a very interesting feature because a lot of times you want to suggest multiple must-see places in a city but often have to send multiple links or references to such locations. Now that everything is in one place, it makes it easier for the others to go through the list and enjoy these specific spots. "Now Google Lets You Review & Share Your Favourite Locations with Others From Inside the Maps App", 2 out of 5 based on 3 ratings.